Ever since its release, Nintendogs has been the best virtual pet game for the Nintendo DS, and probably the best in any other system out there. Everything you could expect in virtual pet simulation, Nintendogs delivers perfectly. You can do just about anything you would do with a real pet. Virtual pets are definitely not Nintendo’s original idea and we all know that the idea of taking care of a virtual cat, dog, monster, or whatever, was already around for quite some time. What makes Nintendogs apart from everything else is that Nintendo put in a lot of effort to make the experience as real as possible. First to notice is that the graphics are gorgeous and those little doggies are as cute as ever. But it’s just not about how the puppies look, they move, act and behave, like real puppies. The touch screen plays its role here as you can pet, brush, and walk your puppy. In return, your dog reacts realistically and changes its mood in relation to how it has been handled. This game features tons of items can be purchased or found to keep your pet happy and healthy. Food, toys, shampoos, and everything else you need in caring for your beloved pet. You can even purchase some designs or decorations for your house. You can always check on your pet’s status and attend to it accordingly. Probably one of the coolest features is the voice commands. Using the DS microphone, your pet now reacts when you call out his name. You can also train your pet with commands like “sit” and “rollover”. With all its features, polish, and just plain cuteness, Nintendogs has become one of the more outstanding games worthy of a try. 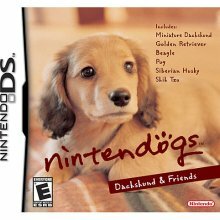 Nintendo has already released 5 different editions of Nintendogs, each with different sets of dogs. This game is perfect for gamers and pet lovers alike.